Chapter 1: What Is Molecular Biology? 1.2 What Is Required for This Work? Never before has it been so critical for lab workers to possess the proper tools and methodologies necessary to determine the structure, function, and expression of the corresponding proteins encoded in the genome. Mulhardt's Molecular Biology and Genomics helps aid in this daunting task by providing the reader with tips and tricks for more successful lab experiments. 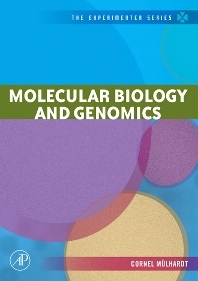 This strategic lab guide explores the current methodological variety of molecular biology and genomics in a simple manner, addressing the assets and drawbacks as well as critical points. It also provides short and precise summaries of routine procedures as well as listings of the advantages and disadvantages of alternative methods. Laboratory practitioners such as professionals, managerial staff, instructors and students, conducting experiments within the field of molecular biology and/or genomics.